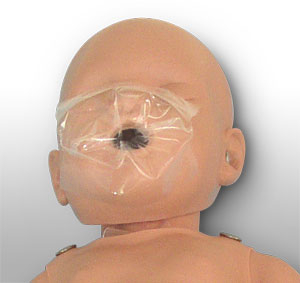 The Sani-Baby 4-pack, economical CPR manikin provides effective CPR and lifeguard training. No cleaning, no disinfecting, no dis-assembly required! This manikin 4-pack makes hands-on practice affordable for all students. Includes 4 Sani-Baby manikins, carrying case, and 100 face shield lung systems. Anatomical landmarks including sternum, ribcage, and substernal notch. No cleaning, disinfecting, or dis-assembly required. Sani-Baby 4-Pack with Carry Bag. Also includes 100 face shield/lung systems. Size: 24" x 18" x 9".